This is not necessarily a typical post, but rather a visual accompaniment to my two posts about Monsteras and propagating them. I’ve been bombarded with questions from readers about where it cut, how to cut, and fret not, I have a video coming out soon all about propagation. 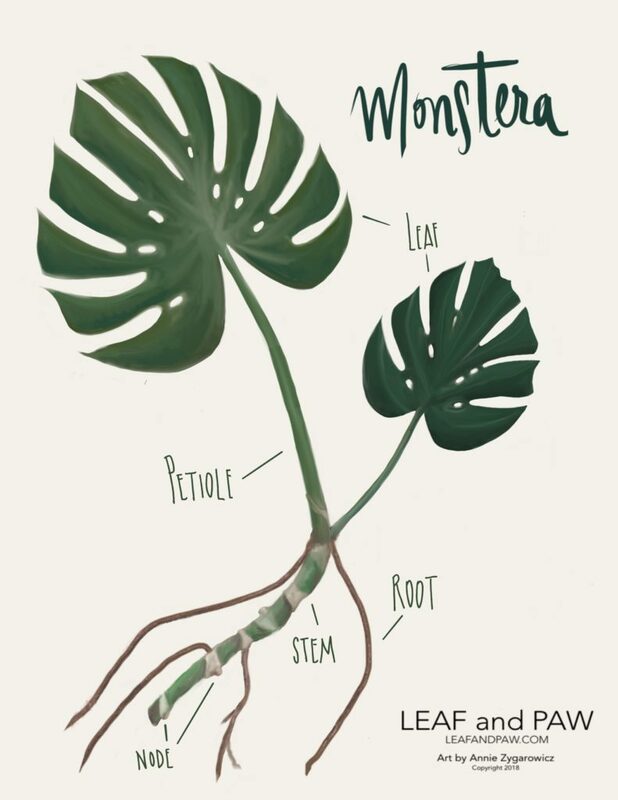 But right now, I partnered with Annie Zyg Illustration to create the gorgeous number – a visual illustration of the Monstera Deliciosa. Interested in a print for your home, garden or over your Monstera’s bed? Instagram or Facebook message me until we get our shop up and running! 8″ x 10″ prints are only $16 (shipped) and are ready to slip into your favorite frame. Find a stem, making sure it includes at least two petioles with leaves. The segment must have an aerial root and node, the node allows the plant to be much more stable once planted, and will eventually grow into a root. Once cut, the stem from the mother plant will harden over. If there were any nodes or roots left on that stem, you’ll get more leaves from those nodes only. The actually cut piece of the stem will not root. Place in water (for additional help, see this set by step guide), and about 1-2 months, he’ll be ready to plant! Anastasia: Hi Emily – you are too lucky to live in a place with wild monsteras! As far as getting them to root, the stems won’t be enough – they’ll need a node which turns into the roots. You may need to get another cutting. Those stems will look great in a vase though! Soil or No Soil? Stakes or Steaks? 1. I’d definitely suggest starting in water to get the initial root going. Not sure if you would have as much luck just putting them in soil. 2. I use these garden stakes since they’re strong and durable. Monty is about 5′ tall and I’m currently using 4-5 stakes to keep him upright. Plus I use them for all of my other large plants too. A moss totem would work, too, but you’ll have to keep it moist. Thanks for reading! Q: Hi there! I have a Monstera cutting from months ago that I had kept in water. It has many many roots now! When is a good time for this leaf with roots to be planted into soil? Thanks! A: Hi! If it has many roots that’s a sure sign! You can plant it any day at this point. Pick a nice planter that’s a tad bit bigger than the circumference of the root ball and use good quality indoor plant soil. It also helps if it’s summer and not fall or winter which is dormant season for plants – he’ll adjust to his new home better. A: Hi Anna, I’ve done both. Monty is very much growing horizontally and staking actually does encourage vertical growth, but pruning the awkward stems did help shape him a bit better last year. Typically I cut off any growth that won’t get sunlight, and turn those into new plants. I have about 4-5 stakes to keep Monty somewhat vertical and usually prune the unwieldy stems every spring. If you do decide to prune, wait until it’s warm, 70+ degrees or so, since he’ll be able to recover better. Hope that helps! Have a question? Ask away! Want a print? Order away! Hi Eve, you won’t be able to propagate them but they will last a while in a vase! Monsteras need to have nodes in order to root. Hey A! I moved my monstera plant in the dead of winter, and majority of the leaves died. I put the stems in water, and they’re rooting. Gonna prepare to plant them soon, but I’m wondering if newleaves will actually grow from them? I still have the nubs from the stems that I cut them from, in soil, and the nodes are also growing. Can I expect new leaves to form? Or should I just look for another plant? Hi Julie! Yes! He is definitely worth saving and you’ll definitely see new leaves form. Be patient as new leaves can take come time, but after the plants get established (3-4 months after planting) they pop out leaves quickly. It sounds like you still have nodes on the mother plants and you should see growth coming from those stems too. Because the plant was unwell, it will take time for everyone to grow and get healthy again. I hope that helps! Thank you so much for the amazing post! I’ve cut few stems from my mother plant. I put all my cuts in water for a couple of months and they made many roots out. I’ve put them in soil today. One of them only has an aerial root and one petiole. It actually had another attached stem with three petioles which I’d cut off to propagate. I wonder the stem without extra petioles and any node would ever be rich bushy like? Hi Lily – you’re welcome! Both will eventually get bushy as they grow and both should grow just fine. Cuttings look leggy and awkward for a while anytime you propagate from a mother plant, but they will improve. Providing support with a moss pole or stakes will definitely help keep them growing upright too. Hey, I have just received a monstera deliciosa variegata cutting in the mail and I have put it in water to root. -Also, the roots from the node already there are almost touching the side of the vase which is already quite big, will they grow fine alone or should I move them into a bigger container? Hi Hannah! I would definitely move the cutting to a larger container and the brown/black roots are fine and healthy. You would only need to worry if they started to shrivel. Good luck! I have taken a cutting when has a large aerial root but no node that I can see! (I can’t find one anywhere on the mother plant) will this be okay? I’ve placed it is a glass jar with water! Hi Rhianne, you should be just fine. 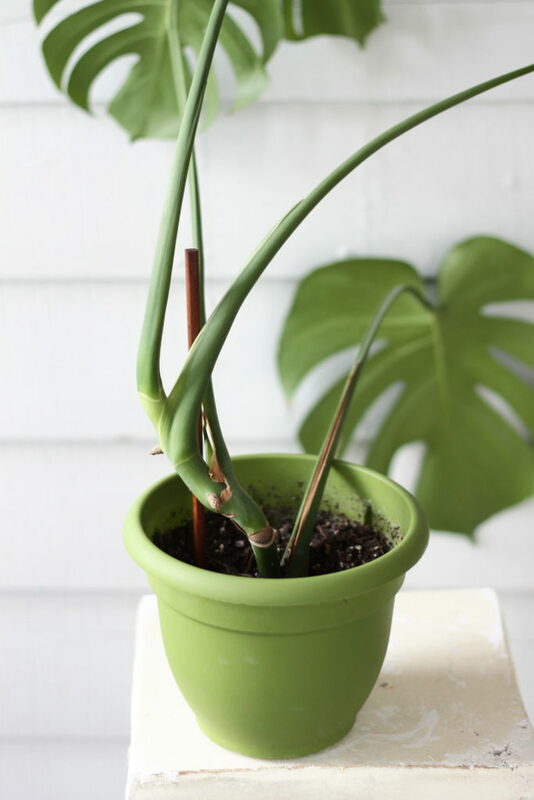 As long as there is a root present, your Monstera cutting should grow a node while in water. I would keep it in water for a while, too, until more roots are obviously growing, probably about 3-4 months. Good luck! I have a propagated monstera that was given to me by a friend from her plant. It grew roots in water so I decided to plant it in soil recently. It even gave me a new petiole and leaf from the original one while it was in water. I didn’t know to look to see if there was an extra node in the cutting before I planted it. If I do not happen to have another node attached to my plant, would my plant ever grow to be larger than just two petioles? Hi Ann, Yes it definitely will! These nodes “appear” as the plant grows, so you will definitely have more as it gets bigger and sprouts more leaves. Hi. I want to cute and propagate my Monstera, however, the root is too long and has grown upward. Is it ok to cut it and just put it in water? Which means the water level will be middle of the petiole. Hi Claudine! That will be just fine – you definitely want the root to be submerged. Just be sure to use filtered water, free of chlorine and chemicals. Good luck! How do I get my leaves to be thicker and not limp? I have started five new cuttings but the original plant leaves are limp and thin. I want my new cuttings to really thrive and fill in when I place them in the soil and not take after the original plant and be limp and look lifeless. Hi Samantha! Do your monsteras have enough sun or light? If the mother plant was unhealthy in any way, your cutting may end up being the same, which is why it’s important to only propagate from healthy plants. I would suggest planting the cuttings in a high quality, nutrient rich soil and placing in bright sun. This will help new growth grow stronger and the plant will produce thicker leaves as it grows and ages. I hope that helps! Thanks so much, I needed to hear that there’s a bit of hope. I just found a node half rotted and half alive with a bit of green that looked like it was going to be a new leaf! just placed in filter water as you suggested. Thanks again for sharing your words of wisdom! Warning: This is a sad story of how I killed my monstera! I had a beautiful monstera that over the summer months it got infested with tiny flies. I tried just about everything to get rid of them. In my efforts I removed the entire top layer about 2 inches deep of the soil and added brand new soil. I must have over watered it because I began to notice a bit of rot on one of the leaves and the texture was very flimsy. While trying to air dry it a bit more I’d set it outside for some cool warm and then bring it back indoors. Well one day I accidentally left it outside and the sun completely killed the majority of the leaves. I basically came home to charred brown leaves and dark black stems. I cried and before I toss it in the trash I’m thinking I should save the roots. Do you think by putting a large nice size root with absolutely no leaves on it will propagate? I have one stump/node without a leaf and a root on it in water now as well after reading your post. Any advice from here?? Oh my Judith! This is a sad story. 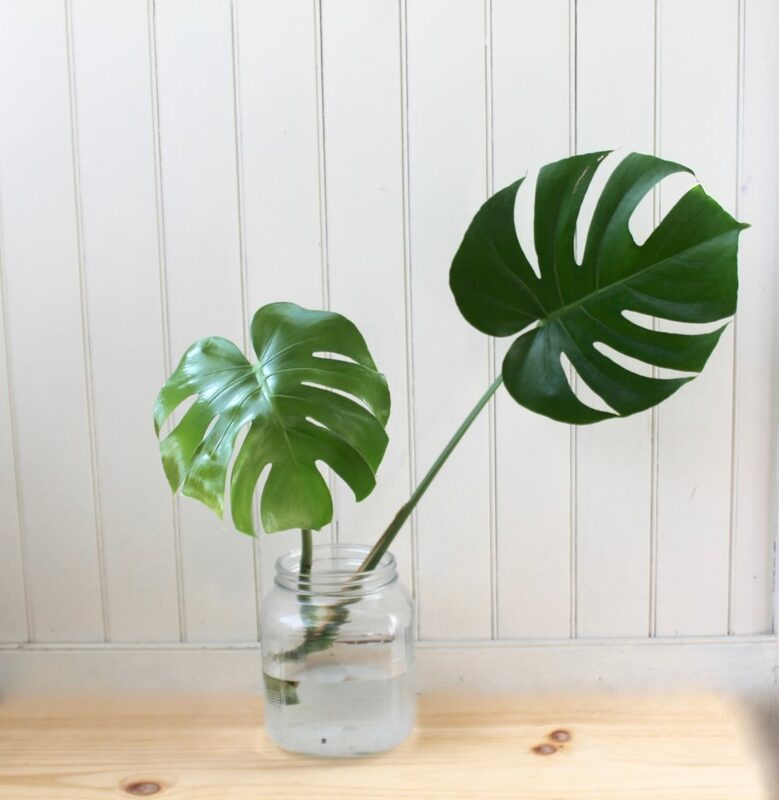 I think putting the roots in water is exactly the best move and will yield the best results if your Monstera were to grow back. Just make sure you use filtered water (nothing with chlorine) and change the water every few days. If the monstera survives, it may take a good amount of time for anything to grow, so be patient. If the roots start to rot or turn black that’s a bad sign. Good luck! And if there is ANY green leaves left right now keep them on, it will help. What happens with the stem that is left on the motherplant? Will it die or will it keep producing new leaves? 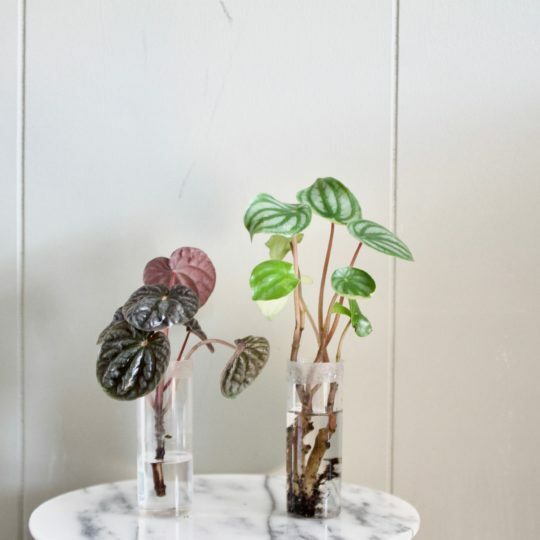 Hi Annica, It will sprout new leaves and sometimes a stem to the side of the cut – it actually promotes new growth and it healthy for the plant! Thank you for sharing your wisdom and experience with this lovely plant. I have two that I propagated from a big one that was in my office before we moved. You do not mention how you trim or care for the aerial roots of the Monstera deliciosa. I saw a post on the Master Gardener website that when this plant is grown as a house plant, we can trim the brown aerial roots with no ill effects to the plant. How do you handle yours? Thanks for the kind words! I know you can trim the brown roots but I’ve never trimmed Monty’s; the only reason being I don’t see a need to. They’re not really in the way, and until he becomes very big and unruly, I probably will just leave them be. Hope that helps!